Steinhardt’s iconic ‘HydroSlide’, which was awarded best regulator in IKT testing in 2018, is among many products to be offered through Jacopa. The highly accurate flow regulators accurately regulate flows within foul and surface water sewers, rivers and other watercourses, providing a constant discharge through the required head range, which utilises the permitted downstream flow rate. The need for a more comprehensive and sophisticated flood management infrastructure has been underlined by the UK Committee on Climate Change who have identified one of the UK’s biggest economic and environmental challenges as the threat posed by global warming. In particular, the imperative to respond to a warmer atmosphere that often holds more moisture resulting in increased rainfall and more frequent flooding. With resilience now firmly and officially on the UK water and wastewater industry agenda the ability to plan for and cope with extreme climate events in order to maintain services and avoid potential disruption is vital for water utilities. 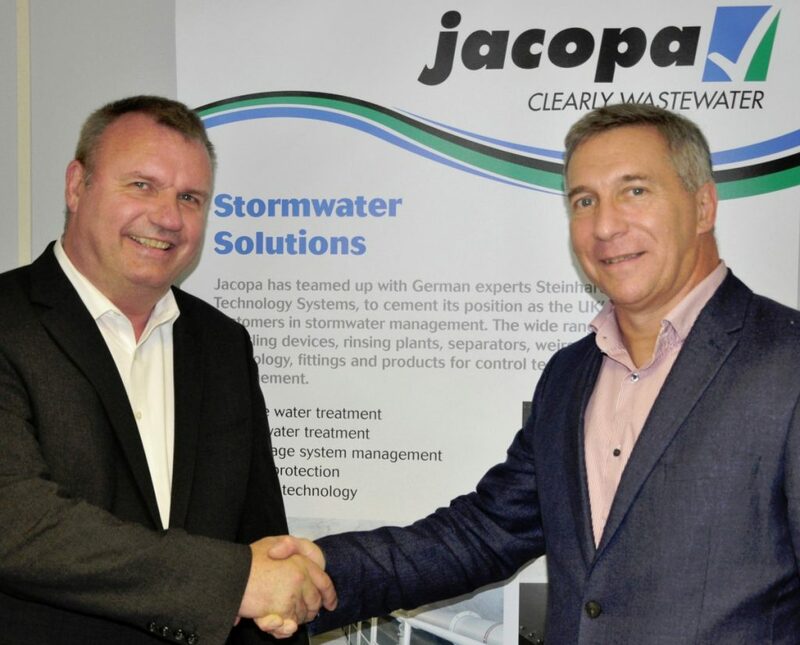 Jacopa are confident that Steinhardt’s creative and cost saving stormwater management technologies and solutions for both the sewerage network and treatment processes will play a leading role in helping water companies address the challenge. What it does: HydroSlide is the generic name for a range of mechanical flow regulators that control the flow rate within foul and surface water sewers together with rivers and watercourses. How it does it: HydroSlide is a variable orifice control, which is to say that as the height of water increases, the orifice becomes smaller. This action allows a constant flow rate to be maintained minimising upstream retention volumes and ‘drain down’ times. What it does: This is a flow regulator that is electrically powered and is controlled via a control panel. The specially shaped penstock module provides accurate control. How it does it: There are a number of control methods, but essentially the aperture is varied dependant upon the height of impounded water. The advantage with powered control is that a number of flow bands can be input relative to either upstream or downstream levels Providing active (real time) control. What it does: Products are available to clean by flush water rectangular or circular storm attenuation tanks and large diameter trunk sewers. How it does it: Stormwater is captured within a storage area and released to clean the floor of the tank when empty. The use of storm water negates the need to used potable water of final effluent. Due to large water volumes being able to be stored, very large tanks can be cleaned in a single simple flush action. What it does: The HydroBend is a weir that collapses as excess flow overflows. This action maintains a constant top water level within the sewer / tank / River / Canals etc. How it does it: There are two versions of the HydroBend: The mechanical version is balanced so that as the water level rises and overflows, the weir collapses to maintain a constant top water level. A powered version is available if a more complex level control is required. This device can be used to prevent flooding.